David Bacon is a photojournalist, author, political activist, and union organizer who has focused on labor issues, particularly those related to immigrant labor. He has written several books and numerous articles on the subject. 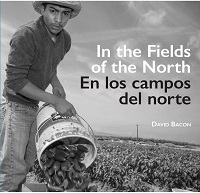 His most recent book is In the Fields of the North / En los campos del norte: , David Bacon documents the experiences of some of the hardest-working and most disenfranchised laborers in the country: the farm workers who are responsible for making California Americas breadbasket. Combining haunting photographs with the voices of migrant farm workers. Host Sylvia Richardson speaks to David about how US foreign policies combined with regressive trade agreements have been responsible for displacing millions of people from countries like El Salvador, Haiti and Mexico, and how Trump is adding insult to injury by repealing the TPS Status (Temporary Protected Status) from people who have been living and contributing to American society for many decades. And how as citizens we must stand together and protect those most vulnerable despite who the president is. This entry was posted in Uncategorized and tagged another world is possible, be the media, bloggers, borders, capitalism, community, Crack Capitalism, dispatches, Flesh Mapping, Global Network, global news, Globalization, how to listen, Illegal, In the Fields of the North, international, internet, interviews, itunes, John Holloway, Latin America, latin waves media, media, media democracy, membership, migration, movements, Nato, No one is Illegal, passion, Peace, podcaster search engine, Podcasting, political, politics, radio, social change, sound, Stuart Richardson. Bookmark the permalink.